Join us on the third Wednesday of every month for Career Crossroads, a look at how journalists, bloggers, and freelancers are adapting to the changes in their media careers. Catch up on previous installments at bit.ly/careercrossroads. There’s a small satisfaction that comes with publishing a story. For journalists, it’s fleeting, and they’re on to the next item that must be covered. Admittedly, Matt Swibel misses those 10 minutes of instant gratification. But the Lockheed Martin director of corporate sustainability has found a way to keep burning that fire of perpetual curiosity. Swibel began his journalism career in April 1999, and he suspended it Oct. 2008. In that time, he’d carved out a solid career as a business journalist, covering marketing, media, real estate, personal finance, structured finance, retail, international business, healthcare, strategy, government contracting, and economic development. He served a couple of years with the Washington Business Journal, covering marketing and media. His last newsroom was the Forbes Washington bureau, which produced content for Forbes and Forbes Asia magazines and the Forbes.com site. He also co-edited the Forbes Billionaires issue. In total, Swibel spent a total of eight years with Forbes. After this time, he started to feel as if he’d maxed out on his ability to expand what he was reporting. By 2008, he decided to change things up. There, Swibel began with supporting the chief financial officer and then the president and chief operating officer, performing a variety of duties from speechwriting to employee communications to media outreach. It presented a diverse portfolio. 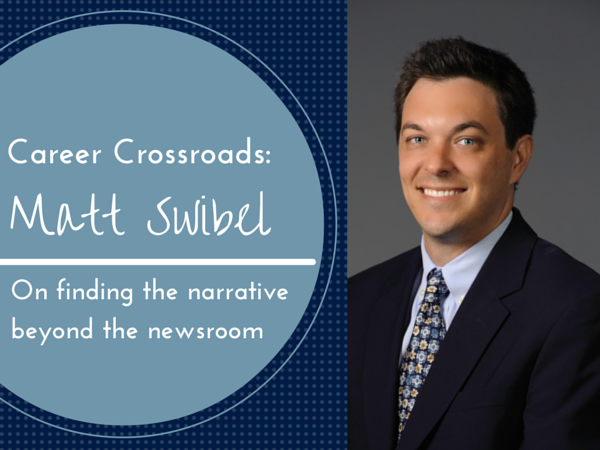 Swibel leaned on his journalism skills and quickly learned the company. Swibel directs sustainability strategy, reporting, and stakeholder engagement at Lockheed Martin, the top-ranked aerospace and defense prime contractor named to CR Magazine’s 100 Best Corporate Citizens list. He led Lockheed Martin’s inaugural report in 2012, and its first issues assessment, formal stakeholder meetings and Global Reporting Initiative-based report in 2013, according his bio with Cornerstone Capital Group, of which Swibel is a member of the board of directors. A graduate of the American University School of Communication, Swibel double-majored in journalism and sociology. He says he strongly benefited from broadening his course content with his sociology studies. Have an interesting story to share about your media career? PR Newswire’s Career Crossroads series features stories and job advice for journalists from journalists. Tell us your story by emailing media.relations@prnewswire.com. You can also stay up-to-date on future Career Crossroads and other media articles by subscribing to Beyond Bylines below. Christine Cube is a media relations manager with PR Newswire and freelance writer. Follow @cpcube or check out her latest Beyond Bylines articles on PR Newswire for Journalists.